It is a good flighted top spinning delivery which pitches in, from good outside the off stump line to middle stump line at a length of 2 to 5 yards and suddenly moves sharply into the right handed batsman after hitting the pitch. It is the ring finger which plays the major role along with the support of index and middle fingers in spinning the ball along with the seam in the direction of leg slip region which finally allowing the ball to move into the right handed batsman after hitting the pitch. So how do you bowl this kind of googly? 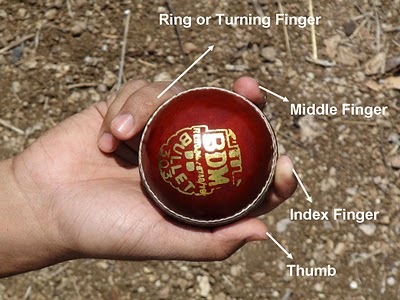 Well as shown in the picture to bowl this kind of googly the ring or turning finger should be in contact along with the seam in down direction, the middle and index fingers should be rested on the seam with a comfortable distance, finally the thumb can be in contact or can be with out contact with the seam since it plays a minor role in spinning the ball, in this type of basic googly bowling. 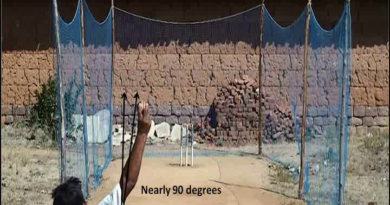 The three fingers index, middle and ring are the key in gripping or spinning the ball in forward direction with the seam facing the batsman or leg slip region. And among these three fingers again the ring finger plays the major role since this is the turning finger which is used to spin the ball in forward direction along with the seam facing the batsman or leg slip region. That’s why we call this ring finger as spinning or turning finger. 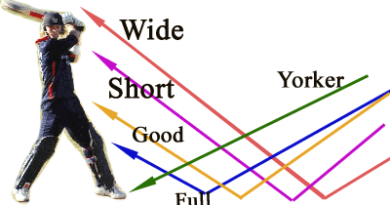 Before every ball you try to bowl or between delivery to delivery you get some time, do this exercise repeatedly, surely you will be getting a nice rhythmic comfortable grip, which allows you to spin the ball in forward direction along with the seam facing the batsman or leg slip region at the time of releasing point. 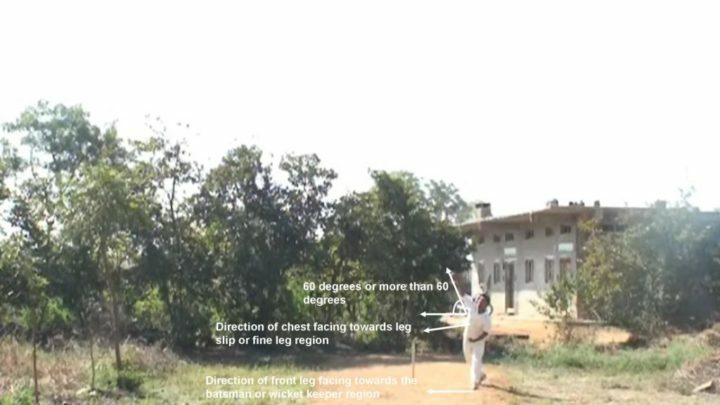 In order to ensure the position of arm to maintain at an angle of more than 60 degrees comfortably the direction of front leg has to face towards the batsman or wicket keeper region and also at the same time the direction of chest has to face towards the leg slip or fine leg region. 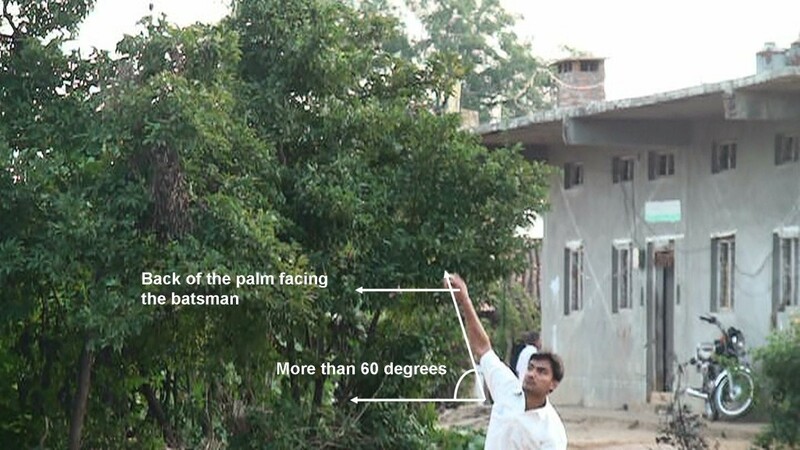 In order to ensure the back of the palm to face comfortably towards the batsman the position of the arm has to be maintained at an angle of more than 60 degrees. 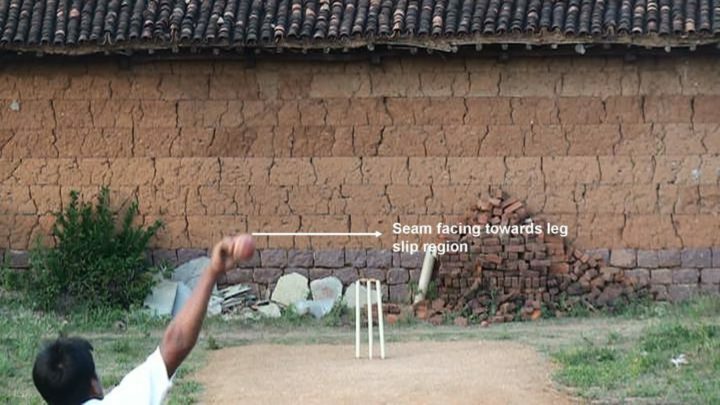 Well in order to spin the ball along with the seam in the direction of leg slip region the position of the wrist has to be maintained in such a way that the back of the palm has to face the batsman. 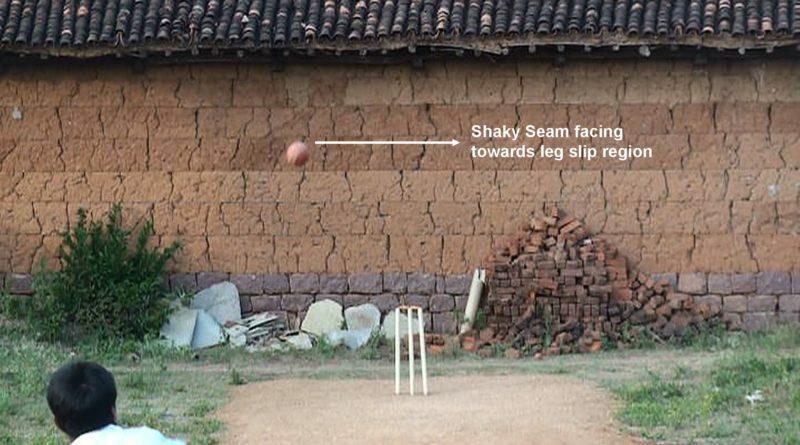 The concept is whether the ball with the scrambled seam or with the position of seam facing the leg slip region, the ball has to rotate or spin in north – east forward direction. 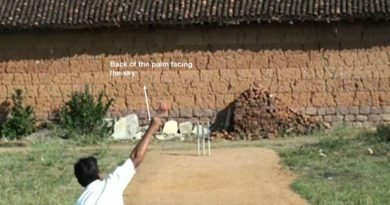 Well majorly with the help of the ring or spinning finger and also with the support of index and middle fingers, try to rotate or spin the ball in forward direction along with the seam facing towards the batsman or leg slip region, which finally helps the ball to move sharply into the right handed batsman after hitting the pitch.